This project received all of the funds contributed by 11/14/2014. Thank you for your support and helping to show doctors and hospitals you love this idea! We will list you as a backer on our website for helping to support ProofX’ goals in personalized medicine! Pin & Keychain - All of the above, plus a ProofX button AND an autoclavable sample keychain of our Med610 resin. ProofX FABLAB T ++ All of the above AND get the T-Shirt to show everyone you are part of the ProofX solution. DOCTOR Reward 1 - Patient-Specific Bone Educational Model - Backers at this tier may choose one proof of concept plastic model (mandible or spine – your choice) which shows patient specific anatomy from previous ProofX case studies. Both the spine and mandible have been used by doctors preparing for particular surgeries. The models are accurate to within 200 microns. You also get one of our ProofX Med610 keychain samples to test! Put it through autoclave and see how it holds up! DOCTOR Reward 2 – Aortic Dissection Replica - Patient-specific, multi-material model which shows high resolution anatomy used by doctors for patient evaluation. The replicas are accurate to within 30 microns and represent the targeted area of the intima tear. This is a component of the Aorta Kit mentioned in the next tier. You also get one of our ProofX Med610 keychain samples to test! Put it through autoclave and see how it holds up! 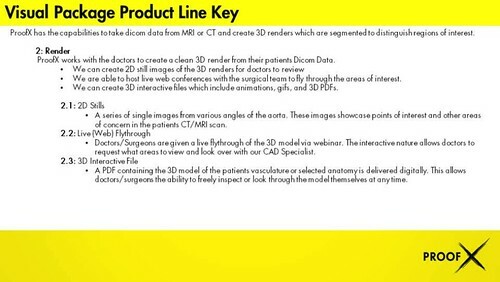 DOCTOR Reward 3 – Complete Aortic Dissection Educational Kit - Patient-specific, multi-material model which shows high resolution anatomy used by doctors for patient evaluation. The replicas are accurate to within 30 microns and represent the targeted area of the intima tear. This is the Whole Case Study mentioned in the Aorta Product Guide. This will also include prints of the 2D still images from the original segmented digital file, The 3D printed assembly showcasing the false and true lumens and the intima with tears printed from a segmented MRI are included. You also get one of our ProofX Med610 keychain samples to test! Put it through autoclave and see how it holds up! DOCTOR Reward 4 – Custom MRI to 3D file - Backers at this tier may send ProofX a high resolution MRI or CT scan file and information about the area of interest. ProofX will then create a 3D model and send you digital images via a secure server for you to view. This model will NOT be segmented, so it will show all anatomy present in the scan file. You also get one of our ProofX Med610 keychain samples to test! Put it through autoclave and see how it holds up! HOSPITAL Reward 1 – Custom MRI Flythrough - Backers at this tier may send ProofX a high resolution MRI or CT scan file and information about the area of interest. ProofX will then create a 3D model and send you digital images via a secure server for you to view. This 3D model will be segmented to show only your area of interest (IE: aorta, bone, etc.) for increased focus and visualization purposes. You will also get a live webinar flythrough of the 3D visualization for your doctors to attend, as well as a video turnaround of the anatomy. CHICAGOLAND SEMINAR - Local to Chicago? ProofX will conduct one of our live seminars for you and your team on 3D printing. This seminar includes time for answering questions your team may have about 3D printing and its applications. Backers may select one of the above listed seminar topics. PARTNER Reward 1 – Live Seminar and Bio FabLab™ Feasibility Assessment - Members of the ProofX team, will travel to your site and host a seminar explaining the benefits of 3D printing and ProofX services. This seminar includes time for answering questions your team may have about 3D printing and its applications as well as ProofX services. This seminar will also include a custom 3D printed business card specific to the event, and feature the ProofX logo and a logo of your choosing. (You can message us for more details regarding this business card.) ProofX will also conduct an assessment of your location for a potential ProofX Bio FabLab operation. The assessment, at minimum, will give the partner guidance in how 3D technology may apply to the partner’s business and how it may be implemented. Aortic aneurysms contributed to 17,215 deaths in the US in 2009 and continue to result in about 15,000 deaths each year. In 2010, aortic aneurysm and dissection alone ranked #63 in the causes of death in the US. Aortic dissection is well known for having a relatively low survival rate. An expansive UK study found that 30-day and 5-year mortality rates were 55.8% and 64.5% respectively, with rates being noticeably higher for type A dissection. The onset and potential fatality of type A aortic dissection is also quite rapid with 33% of those who go untreated dying within the first 24 hours of symptoms while 75% die within the first two weeks. The typical series of 2D MRI images provided to surgeons are cognitively difficult to work with, providing limited information to surgeons as they plan this highly complex procedure. Incomplete treatment and relapses can lead to a cascade of negative effects, affecting patient quality of life, requiring additional surgical interventions, and leading to higher mortality. ProofX aims to lower fatality rates and improve normalcy for those who do survive by utilizing 3D Visualization and Printing to help surgeons identify better, more complete treatment paths specific to each patient. 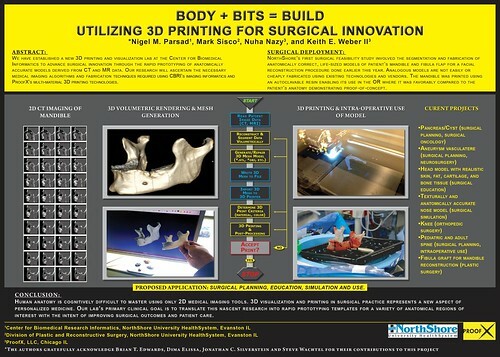 ProofX proposes to make 3D Visualization and Printing technology and expertise readily available to surgeons preparing to undertake complex surgeries. Using the CT/MRI scan of a patient and translating it into a 3D model, ProofX can deliver extensive benefits through multiple products. The first includes a 3D render of the patients’ scan so surgeons may visually “fly through” the patient’s specific complications, identifying treatment paths and potential pitfalls in advance of surgery. 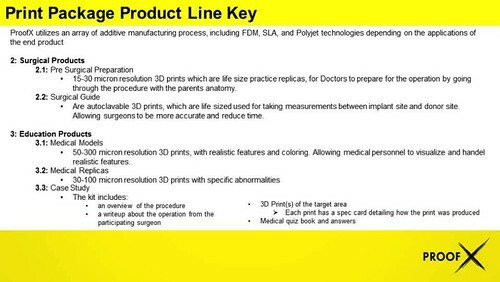 ProofX is also able to 3D print surgical preparation models and in-surgery guides that provide physical, patient-specific, replicas surgeons may use to practice an operation or use in the operating room. These tools provide enhanced pre-surgical planning, improved outcomes, reduce time spent operating, and reduce the risk of cascading events. ProofX will expand the usefulness of this work by developing case specific replicas for educational and research use, providing anatomically correct models, and training replicas for student practice. This paves the way for more accurate diagnoses and outcomes by allowing future surgeons to become more familiar with this condition. Additionally, by offering researchers access to specific replicas as well as customized tool and instrument production capabilities, ProofX provides a new way for researchers to test innovations. In conjunction with the patient’s surgeon, ProofX develops a full training module based on a real world situation. The case studies detail out a specific patient’s symptoms, lab and other test results, the original CT/MRI files, and the ProofX created 3D visualization and printed models. The student can then compare his/her assessment with the assessment of the attending physician in the case. This is a tool that has the potential to truly alter the way surgery is taught and make 3D tools a standard of care. Initially, ProofX works directly with attending physicians to develop solutions for their specific needs. Be that a 3D model flythrough of a unique patient case, a replica of specific anatomy or even a custom pair of tools to assist in the surgery, ProofX delivers a fully customized service for both patients and physicians. In the instance of the aortic dissection, we can offer physicians a further look into the MRI or CT scan of a patient, allowing them greater insight into a surgery before the first incision. This allows for even better planning for an upcoming surgery, while our surgical guides can continue to inform surgeons and assist them in the operating room. These guides not only give a surgeon intelligence on the specifics of a patient’s case, it also helps them to reduce time in the operating room, improve surgical outcomes, and lower OR costs. In particularly difficult and interesting cases, the material, with permission, can be converted into training modules. In some cases, the training modules will include a full case study and the insight of the original attending physician, creating an impact that will reach countless other patients. ProofX is also able to fill the need for creating an ON-SITE Bio FabLab™ at specific facilities. This brings our technicians, machines and 3D printers right into the physician’s office for even faster service and immediate impact! 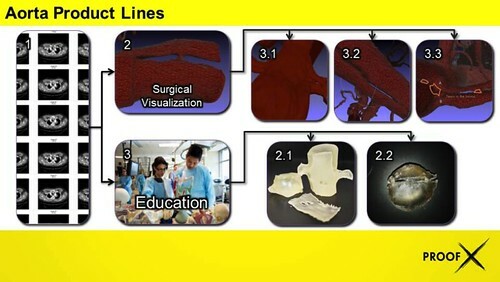 The first step to determining if an on-site Bio FabLab™ is an on-site assessment where a ProofX analyst will meet with surgeons, radiology, operations and other key stakeholders to determine if on-site 3D visualization and printing makes sense and determine the correct mix of technology, staff and equipment. Decrease surgical times, and improve patient outcome in the case of total knee arthroplasty. On average, operating room time was 20 minutes less. 42% decrease in operating room turnover. It also found that the increase in costs made by using patient specific instrumentation, were nulled and even surpassed in the savings made on Operating Room time. A surgical time savings of almost 30 minutes. Allowed the surgeon to complete a strenuous part of the operation long before the patient was in the OR. Prevented the surgeon from straining their hands forming a titanium brace that would be attached to the patients jaw DURING the operation, and instead it was completed several days before the surgeon would be required to do the complex microsurgery. Similar studies to our mandible and fibula case utilizing 3D printed fixtures have also found the same time saving and improved surgical performance, further setting the grounds on a realistic benefit to these devices. This research and our dedication to continuing to collect case studies is helping to set the stage for achieving a wide spread following and usability of medical 3D printing and it’s applications in personalized medicine. ProofX’ products serve to inform and train surgeons and are not classified as requiring approvals by the FDA. ProofX goal of making patient-specific aortic aneurysm replicas available to surgeons and students directly seeks to reduce the high fatality rates associated with aortic aneurysms. The 3D renders ProofX can provide based on available CT/MRI scans allows for improved planning and understanding of medical procedures as well as new means of monitoring aortic aneurysms, especially in cases where preventative surgery is in consideration. The patient-specific replicas also provide a means for surgeons to not only prepare and create tools for a difficult procedure and improve outcomes; they also provide a means to better train future surgeons as well, creating a cycle of research-use-train. The research and products built from this effort create lateral benefits for hospitals, education and research, and establishes ground for further movement laterally as ProofX continues to broaden its experience with other areas of cardiovascular disease. By applying the knowledge and techniques honed here to other areas of development, ProofX will be able to provide similar products to other areas of health study, especially in the case of heart disease. We are all unique, and no patient surgery is ever the same. So why are many of the doctor and surgeon training programs and planning made as if one size fits all? At ProofX we believe in PERSONALIZED medicine, and a large part of realizing that in the surgery room is bringing patient specific cases into a better light for physicians. One that can be seen in 3D on a screen, or as actual objects in their hands! Imagine doctors being able to look at YOUR specific case in 3D and plan the surgery out in advance with the aid of better visuals as well as physical surgical guides. Items they can easily point to and turn to see your unique issue, mark incisions, and even use as a guideline in the surgery room! All without needing to be cut open or put through unnecessary discomfort. All it takes is your original MRI or CT scan, and we can bring that data to life! While radiology technology has improved significantly in recent years, there is still a lot to be desired from the 2D image outputs that physicians must sort through and cognitively re-assemble to properly diagnose a patient. The slow speed of realizing new innovations in the medical sphere is also a large stumbling block for many useful products and tools that can make the difficult job of saving lives easier. Rather than attempt to justify new machinery that has marginal improvements, why not get the most out of the MRI and CT scan machines with which nearly every hospital is already equipped? 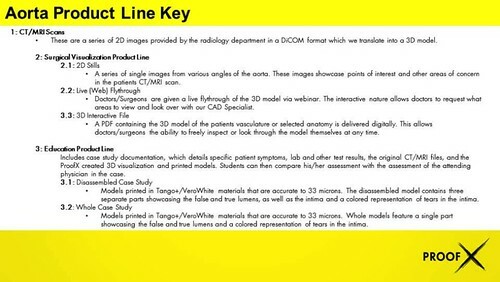 With a higher resolution output from many of the current MRI or CT scanners, we are able to create a digital 3D model that allows a physician to see and explore what each of the 2D still image shots look like whole. This allows for clearer insight into the CT/MRI data, and vastly improved foresight of a difficult surgery before the first incision. The technology ProofX uses incorporates the latest in manipulation of CT and MRI data, but also adds some tools and techniques typically seen in the video gaming world. Additionally, the flexibility of ProofX services allows us to create customized tools and instruments on request. Whether this is an instrument that is needed for a research project, or a set of tools that are custom sized to a surgeon’s hands or for a specific patient surgery, a ProofX Bio FabLab™ can assist rapidly, as well as economically in getting the parts and tools that will lead to better outcomes. With the ever escalating challenges and costs in the medical sphere, practical innovations and services in medicine are more in demand than ever before. What if there was a way to access the latest in 3D visualization and print technology without worrying about equipment costs, staff acquisition and training, or keeping up with the ever-changing technology world? ProofX specializes in creating new innovations and products for the medical sphere with the input of physicians. Our insight and services facilitate a higher return on investment of your in-house technology by using your current MRI and CT scanners to create greater insight and tools for patient care in everything from visualization, to guides, and even to tools and instruments. These patient specific items allow you to not only save time on surgical procedures, but also foster better surgical outcomes and lower costs by further capitalizing on your current technology. Our services also deliver on an individualized and customized scenario that is tailored to both patient AND physician. We can create printed replicas of patients, but we can also tailor instruments to each surgeon’s requirements (large or small hands, left or right, etc.) which helps your surgeons to do their job better. Similarly, we can custom engineer tools that fit a patient’s specific need. This ability to create tailored items and models also allows ProofX to assist in creating proof of concept MVP’s for the creation of new medical equipment or research, helping your institution to super-charge its own innovations. And in the case of an on-site or nearby ProofX Bio FabLab™, it also gives us the ability to print on the spot tools and items without delivery fees or wait times and take advantage of proximity to intimately include the physician in the final product. 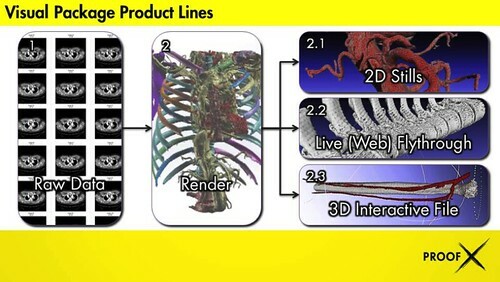 ProofX is able to supply remote visualization of 2D and 3D technology of patient specific anatomy, as well as print replicas and models of these anatomies for use as a surgical guide or a training tool. Similarly, ProofX is also capable of customizing tools and instruments to surgeons, patients and research. This allows us to provide our expertise on creating prototypes for research projects, and assisting in the design of medical devices that require rapid prototyping and services. On top of providing these same benefits as we offer to patients, doctors and institutions, we are also able to provide our expertise in 3D technology to partners in the form of consulting and on-site Bio FabLabs™ that bring our experience, tools and technicians right to your door! As a leader in medical 3D printing, we have evaluated the majority of the additive manufacturing industry and its ubiquitous applications. This information coupled with our own research and experience gives us great insight into how to apply the technology efficiently and effectively. The funds raised via the Open Innovation Challenge would be used to further the goal of making aortic aneurysm replicas available to surgeons and students. This would include the purchasing of software packages, software development to streamline 3D Visualization delivery, material expenses related to the 3D print process, as well as labor expenses that are directly associated with this goal. Increase our ability to convert MRI to 3D digital replicas. Curious what ProofX Will Do With Additional Funding? As stretch goals are met, we will begin expanding our operation to further this aim with the acquisition of 3D Printers, 3D scanners, and additional equipment to help ProofX expand its capabilities into more areas of medicine in need of personalized care. Increase our capabilities to build surgeon- and patient-specific tools and guides. Increase our production capabilities in high resolution SLA replicas. From the team behind ProofX, we thank you for your time and humbly ask for your support in our goal of revolutionizing and spurring innovation in the medical field. Together we can help to pave the way towards a new era of improved and personalized healthcare for ALL patients.